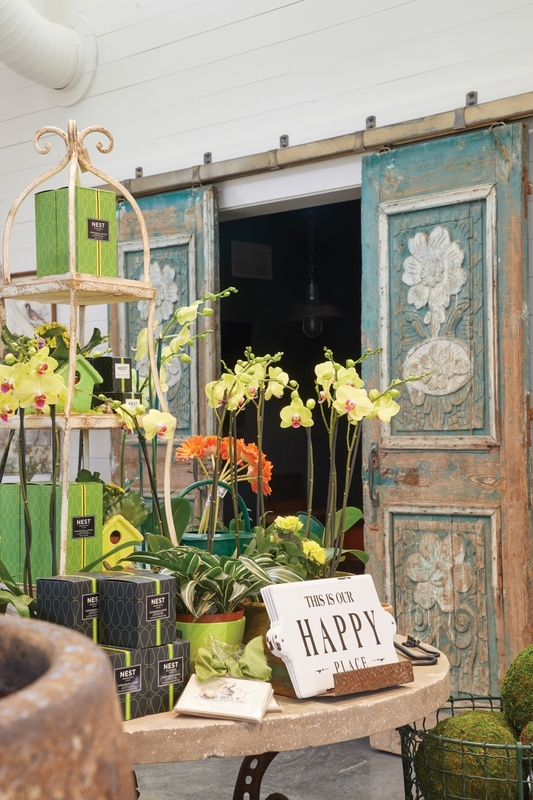 From its humble beginnings as a simple houseplant shop established in 1974 in Mountain Brook Village, Leaf & Petal has grown into a lifestyle brand with three locations that serve up pretty home accents, items for elegant living, and of course, gorgeous plants. Topiaries. Check. Flowering baskets. Check. Herbs. Check. Fiddle-leaf figs. Check. 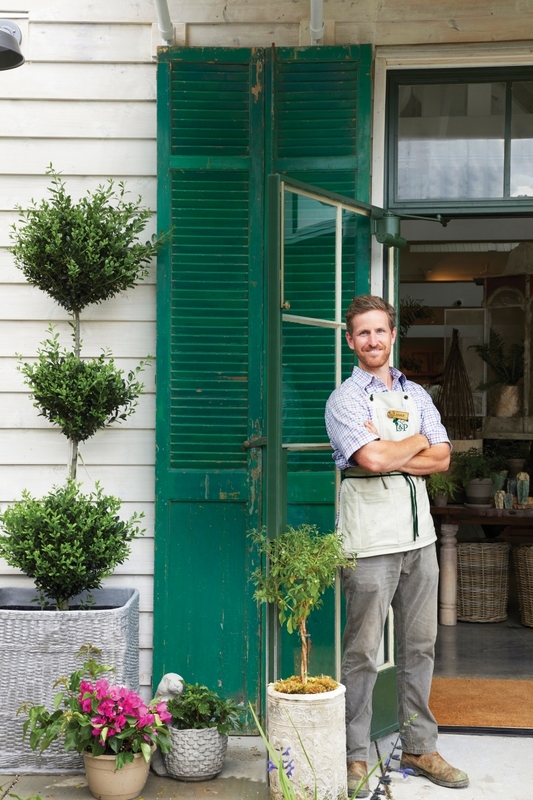 Leaf & Petal offers everything green imaginable, as well as the dirt and oh-so-chic pots to go with it. 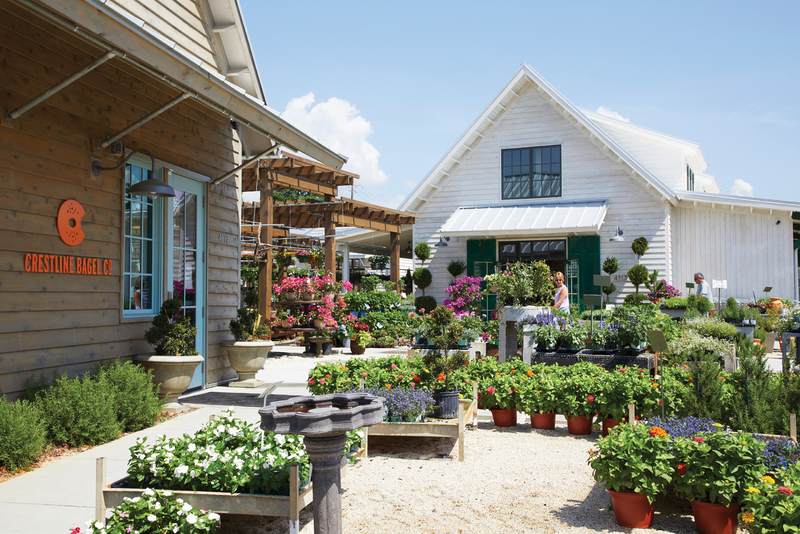 Flourishing under the thumbs of the Pursell family (they are known for their fertilizer business, after all), the brand has blossomed. In 2007, Lydia Pursell opened its second location with Leaf & Petal at The (Botanical) Gardens, introducing gift items, antiques, found objects, lamps, accent furniture, and jewelry. The latest endeavor, spearheaded by owner Jamie Pursell, is the most ambitious of all. “Our ideas are limitless, and our dreams are big, ” touts the company’s website—something Jamie has put into action while maintaining a service-first approach to making each customer feel like the only person in the store. Jamie shares the scoop on Leaf & Petal’s newest location near The Summit. What was your vision for the new space? In the summer of 2013, my wife and I took a “babymoon” to London while she was 7 months pregnant with our first child. 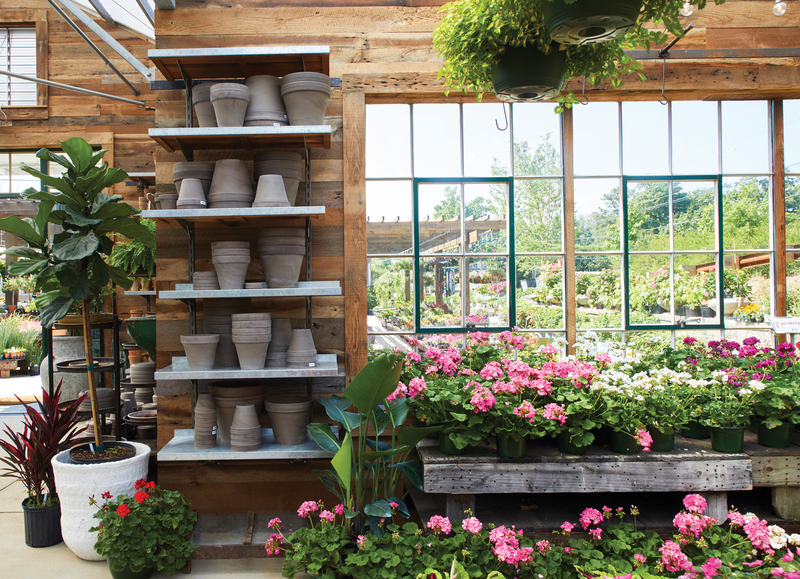 I always love to visit garden centers for inspiration when I travel, and we researched a few to check out during that trip. The experience we had eating and sipping tea in the greenhouse at Petersham Nurseries was the inspirational seed for the entire development. The ambiance of a garden center with its visual beauty and soothing sounds is the perfect backdrop for a dining experience. 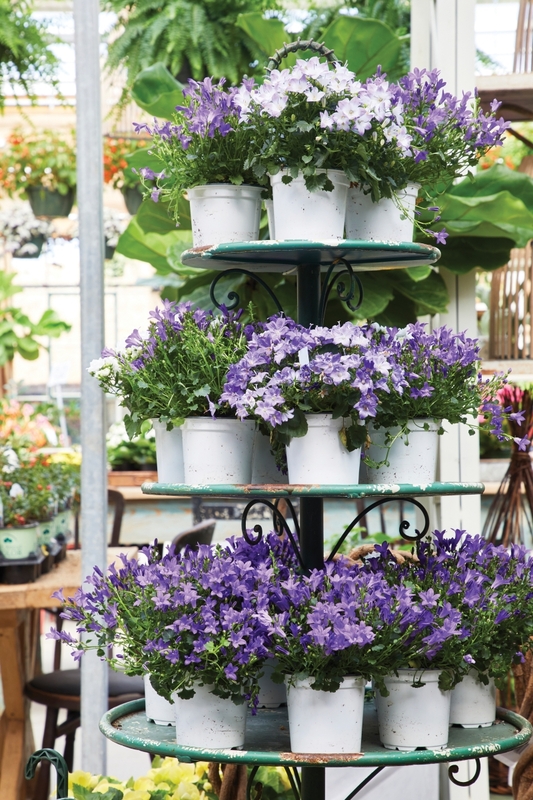 And customers love grabbing a coffee, tea, or sweet treat during a garden shop visit. We saw firsthand that it worked in London, and now we know it works here too. We wanted to create the ideal place to have an informal business meeting or catch up with an old friend. We have Crestline Bagel on one side of the shop, offering breakfast, lunch, and great coffee, espresso, and tea. On the other side, one of Birmingham’s top restauranteurs, Becky Satterfield, is doing a new latin-themed concept called El ZunZun. Who do you credit for the design? There are so many people and influences that had a hand in creating the store. The Pigfords and their team at ArchitectureWorks did an amazing job, and the final result exceeded my expectations. My dad’s wife, Lydia Pursell, made multiple trips to New York, High Point, and Atlanta to pick out the antique fixtures and found objects that make the space come to life. Our stylist team, led by Carl Hatchett and Jane Yearwood, spent weeks designing the layout and beautifully arranging it with product. It was definitely a team effort. You have lots of lovely architectural pieces (doors, tables, etc.). How do these reflect your overall design purpose? Since Leaf & Petal has been around for more than 40 years and has a lot of history and patina, I consciously wanted to avoid building a structure that felt too new. I wanted the facility to have depth and character and to speak to a time many decades prior when materials were solid and of high quality. Some of the architectural elements in the building harken back to the 1920’s, and there also are touches of brass, bronze, zinc, and reclaimed rough-sawn red oak throughout. For example, the bathrooms have a black-and-white hexagon penny-tile pattern on the floors, and the antique half-light doors have original brass “vacant/engaged” door locks that date to 1927. My biggest elective expense included all the old-fashioned steel doors and windows on the buildings. The Bessemer Glass Company still fabricates in true divided light and putty glaze, and their quality of work is on par with any fabricator in the country. We used single-paned glass in all of the doors and windows to give a crisp, clear view of the outside from the inside (and vice versa) that cannot be attained using the modern insulated glass that is the standard in building now. The dominant paint colors are a warm, soothing white and a classic British green. It’s lovely for sure, but it’s also full of hardworking goods and great service. How do you accomplish this balance? Lots of people! It takes about 50 percent more staff to run this new store than the old Summit location did. The store literally changes every single day, so it takes a small army to constantly restock, clean, and keep the merchandise looking its best. During busy seasons, we receive 40 to 50 deliveries every week. This new store is also being offered as an event space. We’ve had seated dinners with 60+ guests and have some booked for well over 100. We’ve let church small groups use the greenhouse as a meeting space during business hours, and we even have an evening yoga class meeting here on Tuesday nights.